“What’s so bad about your life, anyway?” he spat at me. I recoiled from the tone – and the truth – of his words. Though our argument was resolved within the next ten minutes, the words remained, beating within my head, resonating in my heart. Because the truth is – nothing. There’s nothing truly "bad" about my life. My family is in relatively good health. I have a roof over my head, food to eat, financial stability. I have the freedom to be flexible with work and the jobs I take on. I’m blessed with supportive friends. I love our church. I work with great ministry organizations. On the surface, life looks good. So why do his words ring true? The discontent can rise up in so many ways: Feeling frustrated with the challenges this pregnancy has wrought. Thinking someone else could be a better parent to my kids. Hiding my temper, but knowing it’s still lurking in the background. Feeling tired and worn and weary but, most of all, feeling like it’s not ok to feel that way. Sometimes, I feel like a fraud. And it’s exhausting. Because the truth is, while my life might seem easy on the surface, sometimes I’m just treading water, waiting for relief, for bedtime, for a moment that makes the daily mess of life worth it all. It's always when I'm at the end of my patience, when I've had it with sassiness and sticky floors and potty training accidents, that those moments come. When Elise and Tim twirl around our living room at 7 a.m. When a friend texts me to say she knows what I'm going through. When my daughters hold a lengthy conversation with the child in my womb. When my husband takes the baby monitor so I can nap, even though the football game is on TV. When I’m the only one awake in the late hours of the night, thankful for the silence and comfort of a cozy, dream-filled house. When I feel like a fraud, I just need to remember: I'm only a fraud if I'm not honest about the struggle, if I let my outward appearance mask my inner turmoil. The truth is that sometimes, life is hard. 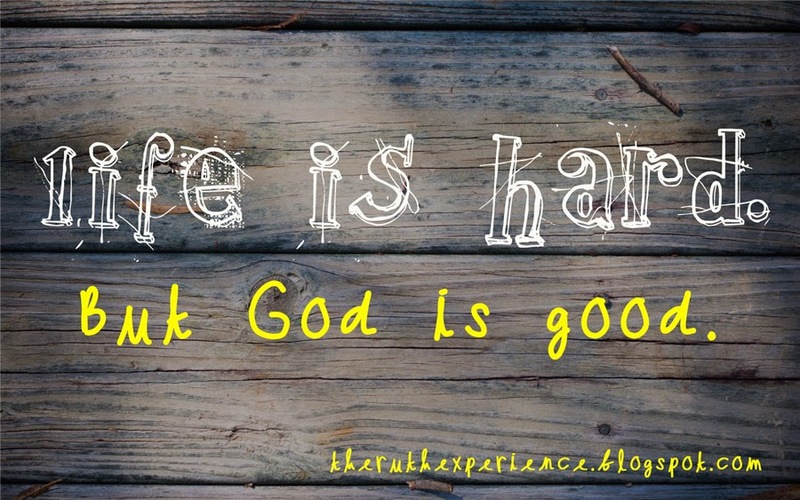 But God is good. And he’s given me so much goodness. I am visitng from Holley's link ups and just had to drop in and say, "oh girl, ME TOO!" Your took the words right out of my heart... just this morning I've allowed discontentment to usher a little of my own sassiness out of my mouth. Thank you for this reminder that authenticity is owning the struggle and worhsiping His goodness at the same time- and that through that act I will find freedom and wholeness - just like He promised! Thank You! Have an awesome Wednesday! I'm always so relieved to know that I'm not alone! :) Thanks for stopping by. So true! "Fine" means a lot, especially to a woman. :) I feel like when my husband says he's fine, he actually means it. This is real faith, " I am only a fraud if I am not honest about the struggle." LOVE! This is what we have to do, be, and share in order to get past those potholes in our faith. Sharing the struggle brings to light what we need to confess, share, pray through, and encoruage others with so that we can also be prayed for and healed ( redeemed, made whole, and completed.) James 5:16. I am encouraged by your words and praying for your heart. Treading water. Oh yeah, I feel like that often, and I can't pinpoint why. There's nothing wrong, but it doesn't all feel right. I am glad to know I can have those days, but then move on! Thank you for sharing this! As Christian women, I think one of our biggest faults is not sharing the hard things that are going on with us. We look good on the outside, and the women around us that are also struggling are wondering what they are doing so wrong if we have it so together! Its so important for us to share what is going on so that we can lift up and encourage each other!